NEW PRODUCT – Stacking Header for Raspberry Pi – 2×13 Extra Tall « Adafruit Industries – Makers, hackers, artists, designers and engineers! 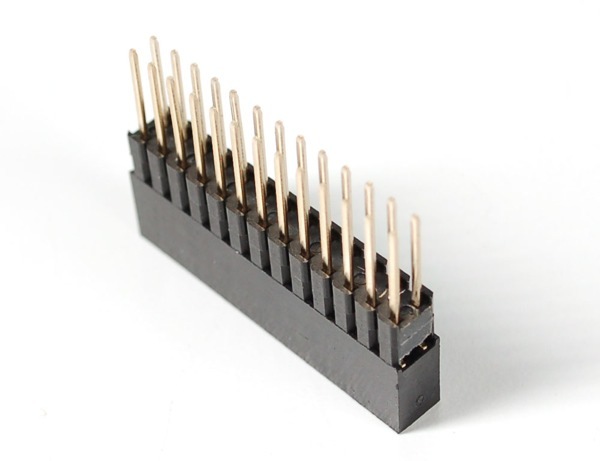 NEW PRODUCT – Stacking Header for Raspberry Pi – 2×13 Extra Tall. Stack multiple plates, breakouts etc onto your Raspberry Pi with this custom-made extra-tall and extra-long 2×13 female header. The female header part has extra spaces to make it 13.6mm tall: when placed on your Pi, a PCB will clear the Ethernet and USB jacks. The stacky pin part is also extra-long, 9.7mm, so that when a standard 1.5mm thickness PCB is installed, there will be 8mm remaining, plenty to plug into. In stock and stacking now!